If there is one essential in my closet it is the chambray shirt. I have four in all honesty and let me tell you why. There is the chambray shirt that I get dry cleaned and pressed. There is the chambray shirt that goes with light denim and the one that goes with dark jeans. Then there is the chambray shirt that has holes in it and fits perfectly in every direction, but I am okay with getting it dirty. That said, the chambray for me is more essential than the white button down and up there beside my favorite pair of jeans. Thus, why I felt it was about time I talked about three ways you can wear this essential piece in your closet as we head into fall. 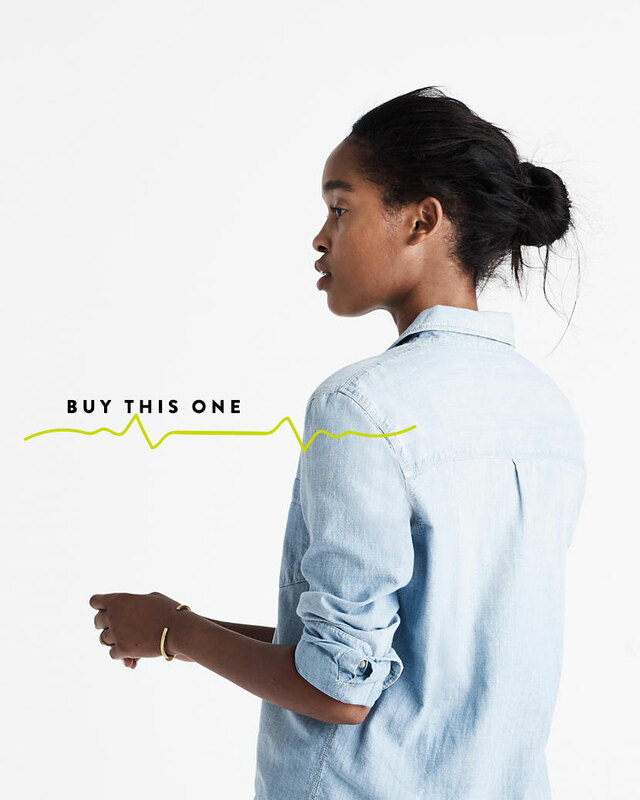 If you do no have a chambray you love, now is the time to hunt for one. They are in every store and you need one to go into this season. The beauty of the chambray is that it is warm but cools well so it is perfect for layering either on a beach vacation or a weekend in the snow. The shirt goes with nearly ANYTHING in your closet. I love seeing it even with other denim. So you need to add one pronto. I suggest being okay with spending a little on it too. 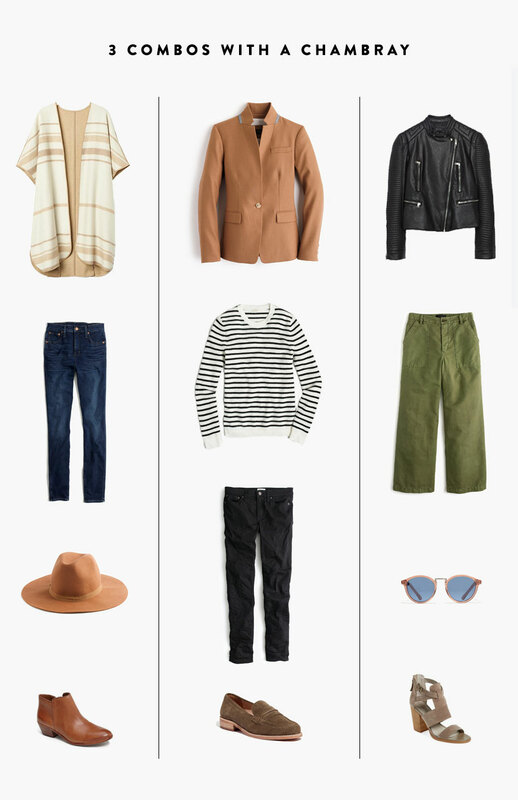 My favorite ones come from Madewell and Jcrew. They wear and wash very well and the fit is always perfect for me. Hopefully you already have this staple in your closet, but either way, I have pulled together 3 combos that are perfect for fall and winter this year to put that shirt to use. Here are three looks to make this essential look completely different each time. Tuck in the chambray and throw on the sweater cape. Loosely and imperfectly roll the base of your jeans and slip on the boots. Toss on the hat and let your hair do what it wants from there. Slip on the jeans and button up the chambray. Throw the sweater on over the chambray and pull the color out. Make sure the cuffs of the chambray pop out from under the sweater. Showing the layers is important. Slip on the oxfords and toss on the blazer. Put on the culotte pants and then toss on the chambray and tuck in one side…kind of like you messed up but this is the look here. Slip on the heels and toss on the leather jacket. Make sure the cuffs of the chambray show from underneath the jacket and don’t forget your shades before you leave the house. 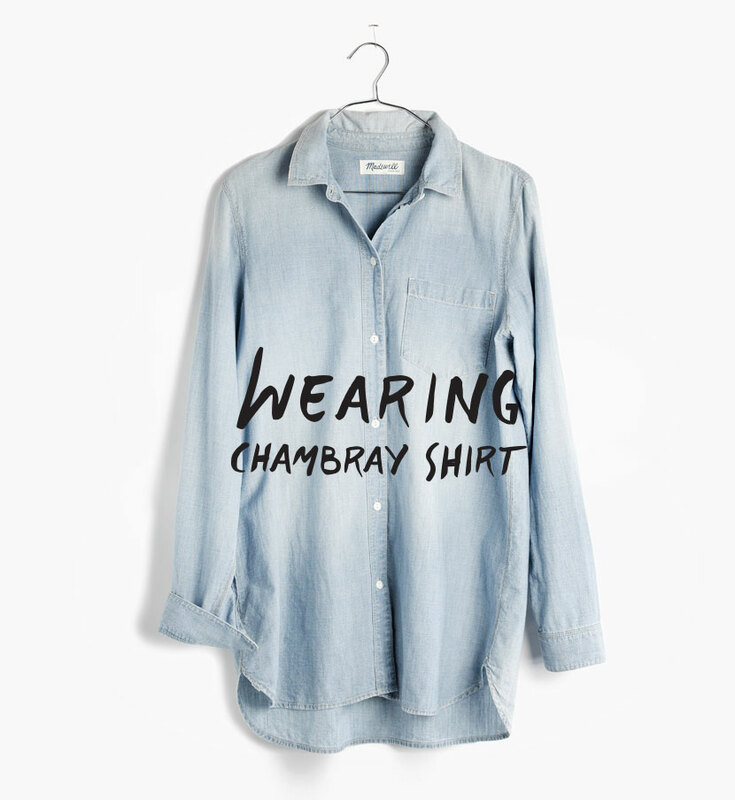 What is your favorite way to wear your chambray? Where did you find your’s? Do you have more than one like me? I love my chambray shirt, but I need to buy a few more pairs based on how often I wear this one. My beloved chambray shirt is by Mossimo. I found it at Target in the spring and have worn it with everything. I’m actually wearing it now over a dress to combat the chilly fall temps in the morning. You can’t go wrong with chambray and having a few pairs is the way to go!